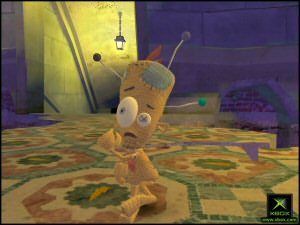 Sprawled out over roughly 30 levels, Voodoo Vince is the latest in a recent crop of platforming games to hit the gaming public. As you might have guessed, the game lightly flirts with the topic of voodoo and being a voodoo doll sees us hurting the main character in order to do away with his foes. An interesting concept and one that we are going to explore in further detail in this review. First thing to get out of the way is that this game is honest to goodness old fashioned fun. I always consider the XBox to be more of the adult gamers console and stress when a title that is appropriate for younger players is released. This was not the case with this one. It's perfect for gamers both young and old. 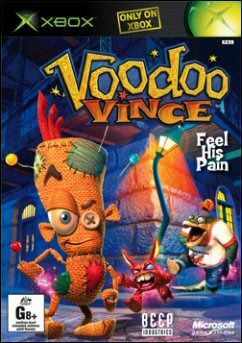 Vince is a Voodoo Doll and they are used to inflict pain on one's enemy by hitting them or sticking pins into the doll to simulate injury on the real person. A unique twist to the title lets the player injure Vince in order to allow him to inflict pain on the opposition, it was a fun idea and one that for some reason never ever got old. Vince's world is a nice looking one and the lead character himself is a delight to behold with very thorough texturing and attention to detail on display. His animations are varied and attacks consist of the quite standard ones found on practically any platform game worth it's salt. It's important to bear in mind that the focus of the game is to solve the simple puzzles and jump and run about to achieve your objectives. It's not a fighting game by any stretch of the imagination, nor does it pretend to be. 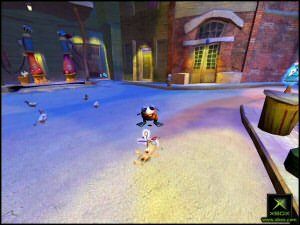 The theme of the game is Voodoo and the developers have captured the feel of New Orleans very well without overdoing it. My primary concern was that there were no women on balconies with beads around their necks, somewhat disappointing but I guess we can't have everything. If you are scratching your head about that last sentence, do some reading about the Mardi Gras that occurs there. I would have to say that Vince keeps the fun going the whole way through the game and there is even an incremental increase in difficulty as you progress. 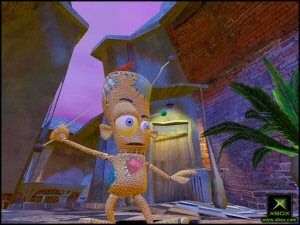 For the experienced gamers out there, Voodoo Vince isn't going to be that much of a test in the puzzle department, but will still be a fun way to pass the time. For younger players there is a great hint system that will assist you with the title if you get stuck. I liked the fact that the game had a great sense of fun to it all the way through, there is always some sort of joke or event happening and made the title all the more immersive to see what would happen next. The only real sticking point I had with the title overall was that the camera was on the very rare occasion a bit niggly, not following the action as well as it should. It was never enough to really hurt gameplay, but cameras in games are a pet hate of mine if they do not work perfectly every time. My standards in this regard are fairly high as I am of the belief that even a game where the main character is a stick figure would play well if the camera follows the action properly. Controls for the title are intuitive and very easy to remember which is a blessing in a platform game. Vince reacts very well and promptly to your button pushes and if something doesn't work, it is simply the player's fault, I couldn't attribute anything to the game not reacting in time to a combination of button presses. This is a strong positive in a genre where timing can be critical. The audio in the game is appropriate to the theme and overall sense of fun that you get whilst playing. Remember that the setting for the game is in the good old south so you get tunes that are suited to that area. Voices are clean and crisp to listen to with excellent examples of character interaction. All things said and done, this would have to be the current king of platform titles on the XBox; there's not a lot to choose from in this genre, but this is one good game that every player would get a kick out of. I would heartily recommend it to anyone.